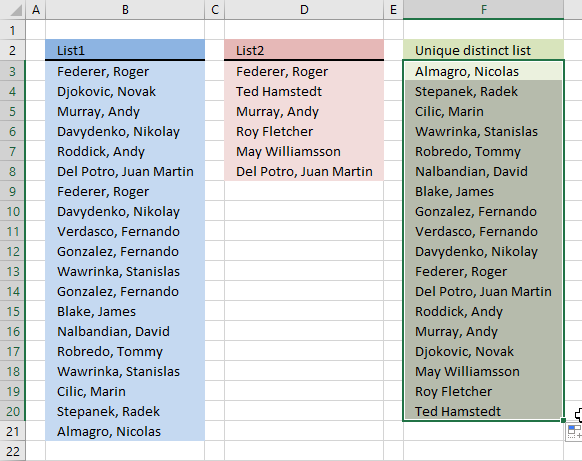 I am looking for the same formula on this page, but targeting a range of MxN (spanning multiple columns) not just a list in one column. And just to ask for the 'frosting on top' remove errors. The image above demonstrates an array formula in cell B8 that extracts numbers and text in sorted order, numbers first and then text from A to Z based on cell range. 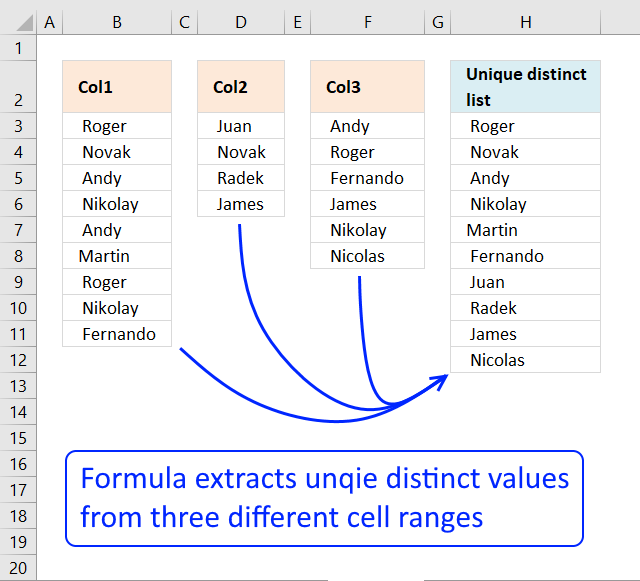 If you want to use a faster way than an array formula then check out Extract unique distinct sorted values from a cell range [UDF]. 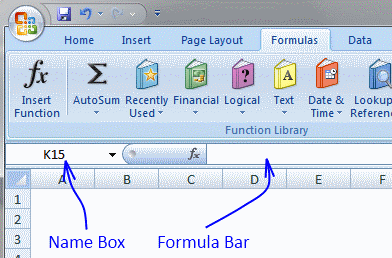 You need to customize the formula so it suits your worksheet. 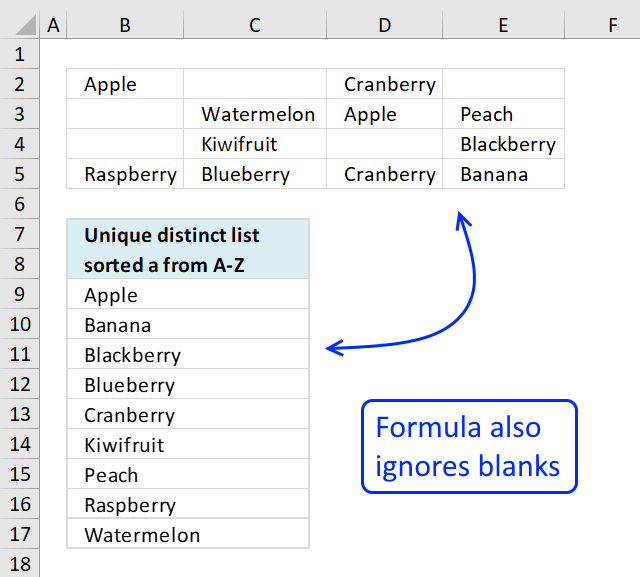 It is easy, simply replace all instances of $B$7:B7 in the formula above with a cell reference to the cell right above the cell you enter the formula in in your worksheet. Example, you are about to enter the formula in cell F7 in your worksheet, you now need to replace $B$7:B7 with a reference to the cell right above cell F7 and that is F6, however, it must look like this: $F$6:F6. 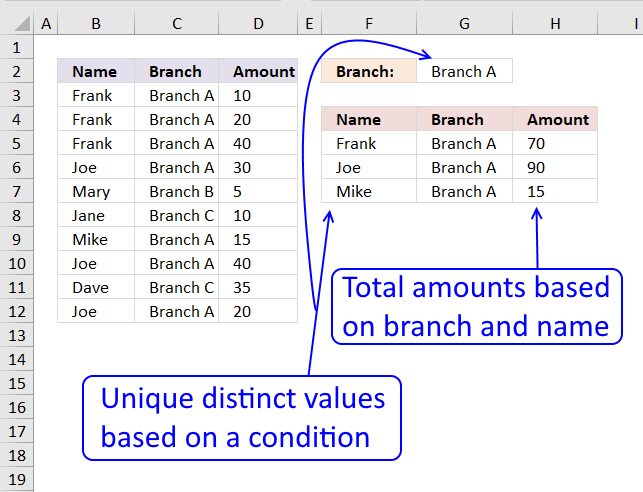 It is a growing cell reference that will expand automatically when you copy cell F7 and paste to cells below, I will explain it in greater detail below. The formula above contains a named range tbl, it is simply a reference to a cell range and they are easily and quickly created. Type tbl in Name Box. 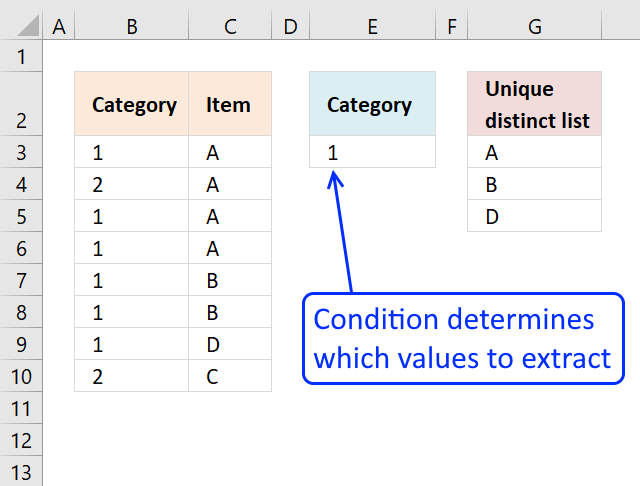 There are two parts in the new array formula above, the first part extracts numbers from the cell range and the second part extracts text values. The IFERROR function moves from the first part of the formula to the second part as soon as an error is detected in the first part. An error is created in the first part when there are no more numbers to extract. This array contains boolean values indicating if cell is empty (FALSE) or not empty (TRUE). The AGGREGATE function lets you extract the k-th smallest number ignoring error values. and returns 8 in cell B8. 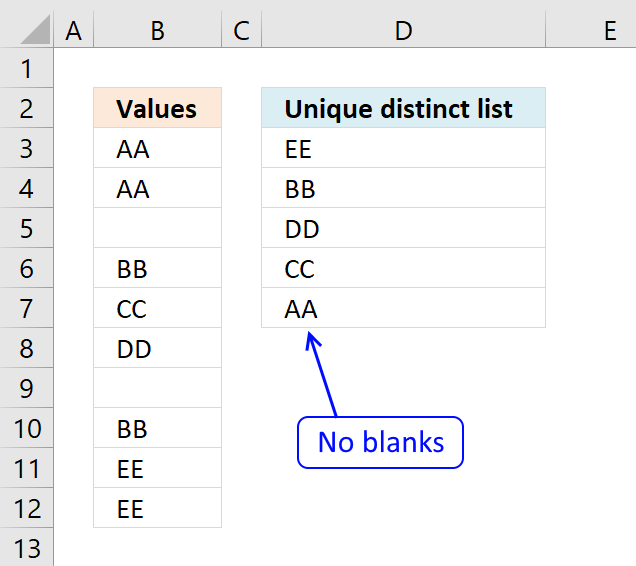 The following steps explain how to extract text values sorted from A to Z ignoring blanks. 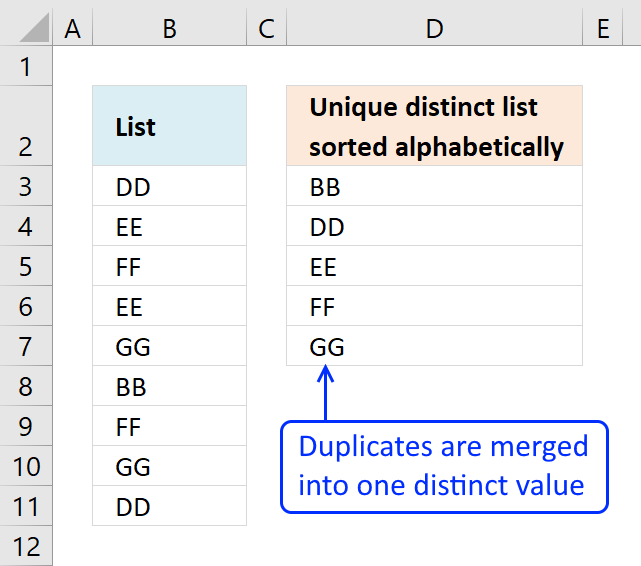 This step extracts a number indicating the alphabetical sort order of each text value. Note that it is the formula in cell B10 I am explaining now. 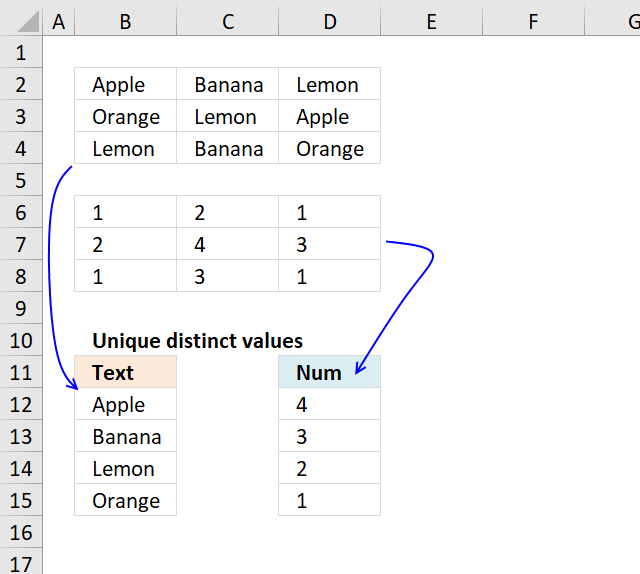 The ISTEXT function returns TRUE if the cell contains a text value. COUNTIF(tbl, "<"&tbl) returns an array containing numbers representing the alphabetical sort order of each text value. 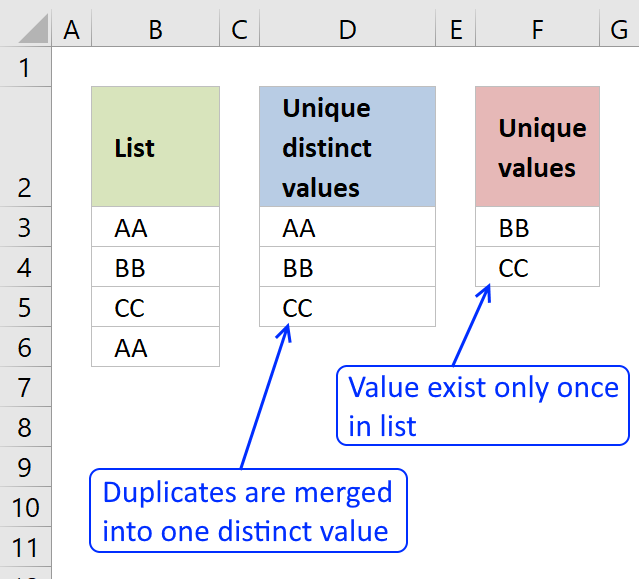 COUNTIF($B$7:B7, tbl&"") makes sure that values displayed above current cell is ignored, we don't want to extract duplicate values. The SMALL function extracts the smallest value in the array. The IF function compares the smallest number to the array in order to identify where the value is located. COUNTIF(tbl, "<"&tbl)/ISTEXT(tbl) returns !DIV/0 errors for all numbers in the cell range, we want to compare text values only. 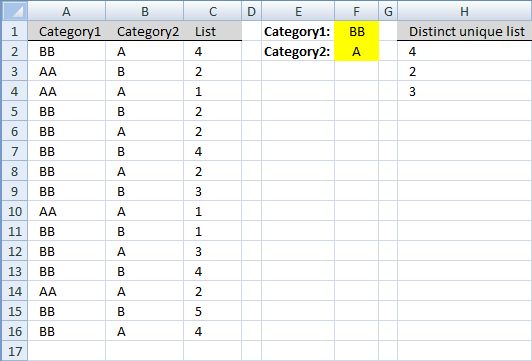 (ROW(tbl)+(1/(COLUMN(tbl)+1)))*1 returns unique numbers for each value in cell range, we must avoid duplicate values in the array. The TEXTJOIN function concatenates values ignoring blanks. and returns "Apple" in cell B8. Awesome. Unbelievable. This has got to be one of the coolest formulas ever. Well, certainly that I've had the need to dream requirements for. Thank you so much! And you might also want to add to your bullet list at the top of the Answer section that it handles numbers and text together. Some of your other formulas weren't for both. I'd have to guess that you won't get many more requests for enhancing this because it does everything I can imagine and is just outright awesome. You've just made my day. BTW, I'm not a big fan of named ranges for my application, so I hard code the range. The way I set it up is with headers in row A, the formula in A2 and drag it down. I have my original data range in B2:D4. Here's all of that hard coded. It's nothing more than a search and replace of yours, so there's no functionality change, just a formatting change to avoid named ranges and rearrangement of where things are. This is great. Do you have an example where the values are just on one column? Thanks! i have question, what i must do if i want to have duplicates data. i mean in sort list i want to see duplicates. Is there a version of this that works if the "tbl" is actually 3 different columns (non-consecutive)? 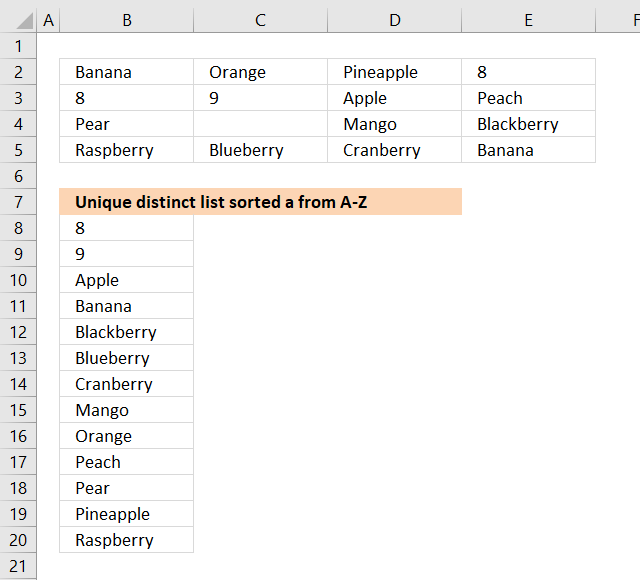 I used the post "Extract a unique distinct list from three columns in excel," (https://www.get-digital-help.com/2009/06/20/extract-a-unique-distinct-list-from-three-columns-in-excel/) but that formula does not remove blanks, which I need. Also, sorting alphabetically is not necessary.